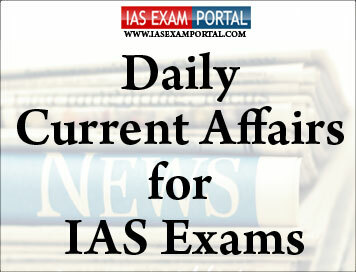 Current Affairs for IAS Exams - 18 JANUARY 2018 | IAS EXAM PORTAL - India's Largest Community for UPSC Exam Aspirants. The Supreme Court on Thursday gave the Lokpal search committee time till February-end to short-list a panel of names for chairperson and members of the Lokpal to be placed before the high-power selection committee led by Prime Minister Narendra Modi. A Bench, led by Chief Justice of India Ranjan Gogoi, fixed the deadline for the search panel on the PIL litigation petition filed by NGO Common Cause. Under Rule 11 (2) of the Search Committee Rules, 2014, the panel recommends at least five names for chairperson and at least three times the number of vacancies in the case of members to the selection committee. The Department of Personnel and Training’s notification, issued on September 27, lists the names of the eight-member search committee, led by former apex court judge Ranjana Prakash Desai. The selection committee comprises the Lok Sabha Speaker, the Leader of the Opposition, the Chief Justice of India and an eminent jurist as members. At the previous hearing, the government said a search committee was constituted in September 2018. Speaking at the event, the President said that Kumbh is the biggest congregation of humanity of the world and this provides for a great platform to spread the messages of Cleanliness and eradication of untouchability as was practised by Mahatma Gandhi. The Uttar Pradesh Chief Ministersaid that about 2 crore 25 lakhs devotees have taken holy dip during the two days Makar Sankranti bathing festival. Addressing the three day Gandhian Resurgence Summit at Parmarth Niketan, he congratulated the Mela officials for their efforts and arrangements for the first Shahi Snan. He said elaborate security arrangements have been made for the Mela with cleanliness and sanitation being top priority during the Mela. He said above one lakhs toilets have been constructed in the Mela area to ensure open Defecation free Mela area. The National Green Tribunal (NGT) on Thursday directed Volkswagen India to deposit Rs. 100 crore with the Central Pollution Control Board (CPCB) by Friday. Coming down heavily on the company for not complying with the November order, in which the NGT had directed Volkswagen to deposit the interim amount with the CPCB, the green panel warned of punitive action against the company directors, in case of non-compliance of orders. In November, the green panel had directed Volkswagen to deposit an interim amount of Rs. 100 crore following allegations that the company had used “cheat devices” in emission tests for its diesel vehicles. The Indian pharma industry now has an opportunity to increase exports to Iran, following a rupee payment mechanism agreed upon recently by India and the Persian Gulf nation. Under the agreement, Indian refiners make payments in rupee for oil imports from Iran, to designated accounts maintained with UCO Bank. A portion thus received is to be used by Iran to pay for imports from India, including pharmaceuticals. With a cloud of uncertainty hovering over continued pharmaceutical supplies from Europe in the wake of the U.S. sanctions against Iran, the Indian pharma industry could explore opportunities to step up exports, he emphasised. The U.S., had in May last year, come out from a nuclear accord with Iran and re-imposed sanctions. The rupee payment agreement came within weeks of the sanctions to cover oil imports from Iran. Constituting mostly APIs (bulk drugs), Indian pharma exports to Iran have been declining in recent years. From $180.50 million in 2015-16, pharma exports to Iran fell to $160.33 million in 2016-17. Mr. Bhaskar said Indian drug makers ought to eye a bigger pie in Iran’s $1.3 billion generic market. Social networking site, Facebook said on Thursday that it removed hundreds of Russia-linked pages, groups and accounts which were part of two big disinformation operations targeting users outside the U.S. The Facebook said, its latest effort to fight misinformation came after it found two networks that engaged in coordinated inauthentic behavior on Facebook and its Instagram service. Facebook's head of cybersecurity policy, Nathaniel Gleicher, said, one network of 364 pages and accounts was linked to employees of Sputnik, a Russian state-run English-language news site. Meanwhile, Sputnik criticized Facebook's takedown. A North Korean envoy arrived in Washington on Thursday for expected talks with Secretary of State Mike Pompeo and a possible encounter with President Donald Trump aimed a laying the groundwork for a second U.S.-North Korea summit. The envoy arrived on the same day Mr. Trump unveiled a revamped U.S. missile defense strategy that singled out North Korea as an ongoing and “extraordinary threat,” seven months after he declared after his first summit with leader Kim Jong Un that the North Korean threat had been eliminated. The North Korean visit could yield an announcement of plans for another summit between Mr. Trump and Mr. Kim Jong Un, the source said, speaking on condition of anonymity. Mr. Kim Yong Chol will be the first top North Korean official to stay overnight in Washington since the late Vice Marshal Jo Myong Rok did so ahead of talks with then-President Bill Clinton and Secretary of State Madeleine Albright in 2000. Communist-ruled Vietnam, which has good relations with both the United States and North Korea, has been widely touted as the most likely venue for a second meeting between Mr. Trump and Mr. Kim Jong Un. India will train participants from 45 countries in nano-satellite making through a new capacity building programme. The programme named Unispace Nanosatellite Assembly and Training by ISRO (UNNATI) was flagged off by Minister of State in Deparment of Space Jitendra Singh in Bengaluru yesterday. Speaking on the occasion, ISRO chairman K Sivan said, the programme allows India to share its knowledge and expertise in space sector with other countries. ISRO will train 90 officials from 45 countries in three batches. The first batch will have 30 participants from 17 countries. The programme is the space agency's initiative to commemorate the 50th anniversary of the first United Nations Conference on the Exploration and Peaceful Uses of Outer Space (UNISPACE50) in 1968. The participants will receive a training of eight weeks in Bengaluru in technologies related to making nano-satellites. Nano-satellites are small satellites weighing between 1-10 kg. The course will include theoretical work, as well as training on assembly, integration and testing of nano-satellites. Monaco is a tiny independent city-state on France’s Mediterranean coastline. The 24-year-old Vinesh from Haryana made a sensational comeback after battling a long injury lay-off to win a gold medal at the Gold Coast Commonwealth Games and Jakarta Asian Games.